Being our first commercial building, the 20thSt. 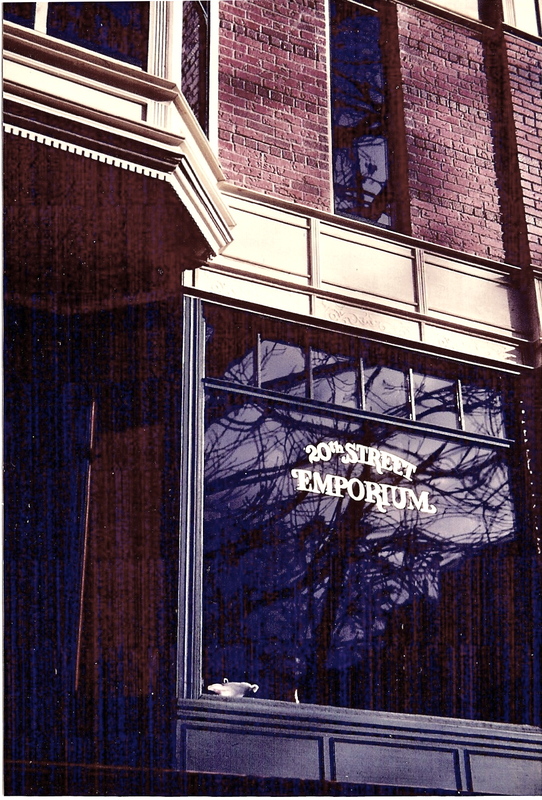 Emporium required a jump-start for our learning curve. 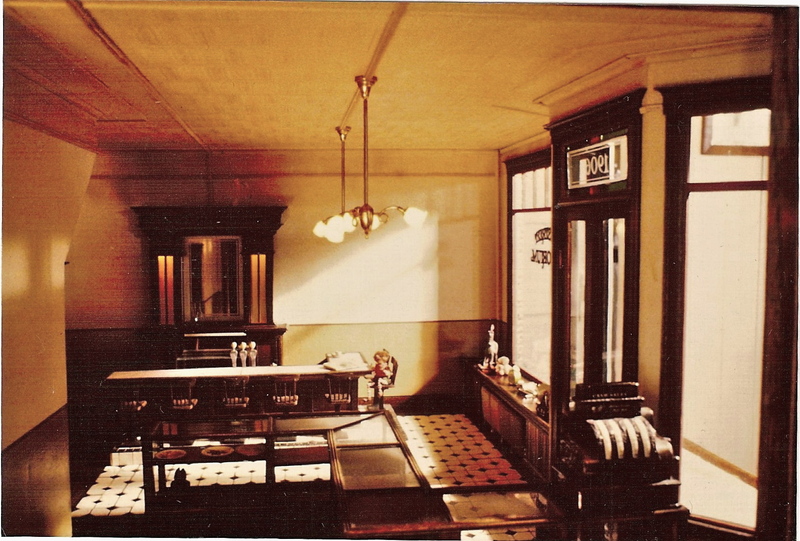 The three-story structure would include a 7-stool soda fountain and mirrored backbar. 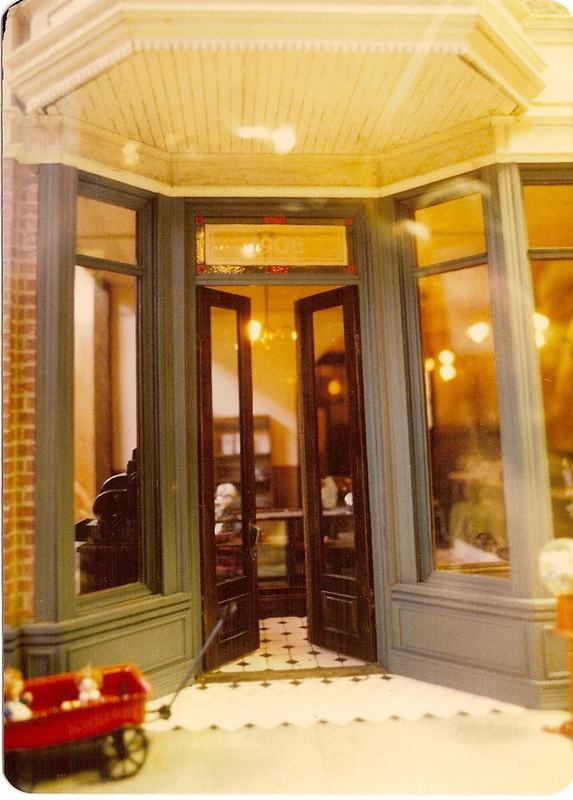 To show it off we wanted gold-leaf lettering embellishing the reflective surface of the old wavy-glass display window. We also wanted a real tile floor, not an embossed paper look-alike, preferably white tiles with angled corners to allow for even tinier black tile inserts at the junction of each cluster of four. Again, tile would reflect more light, and draw the viewer inside. We wanted the building to have a warm, gem-like feel. How we would accomplish these things was a mystery, but we forged ahead, and waited for the solutions. This time they came from people we met along the way. At one of the early miniature shows, we ran into Marie Freidman of Portland, OR. She was selling egg-shell thin dinnerware, Delft tiles, light fixtures with real cranberry glass shades, and leather horse saddles, all made by Marie, and in 1/12 scale. At her home she showed us her multiple workshops, full of specialized tools and supplies. Marie was one of those people gifted with an engineer’s mind and a craftsperson’s soul. She could figure out how to make anything she wanted to, as well as complete it with an artist’s sensibility. She liked us and our work enough to offer to make lights for us, as many as we needed, just for the satisfaction of making them. Marie didn’t want our money, saying she’d figure out some kind of return down the road. When we asked her about making floor tiles for the Emporium, she was up for it. She built molds to fire hundreds of ½”sq. white tiles, new molds for the ¼”sq. black centers, and conjured a way to make the perfect angle cuts on each of the white tiles, so the black pieces would edge into the pattern smoothly (unfortunately I do not have a better photo to illustrate that pattern). It was our job to lay them on a near-perfect grid, and then age them, both to kill the gloss (we had no idea how shiny they would be, they all but jumped out of the room) and create a surface we could age with paints. The glaze turned out to be extremely hard, but Noel sanded, scoured, used glass-etching acid and rasped away enough of the surface to convincingly age them. Plus he broke and cracked a few in the corners and heavily trafficked areas. And, we had enough leftover to tile the entrance out to the sidewalk. The second chance meeting came one night when Noel went out for a beer at a place called The Sore Thumb—a moonlight business built and owned by, of course, a local contractor. On the way in he noticed a van decorated with intricate, hand lettered signs, much of it in gold and silver leaf. At the bar he joined a group of cohorts talking with a woman he didn’t recognize. Sure enough, she was a traveling sign painter, and gold leaf was her specialty. She latched onto the miniatures idea, and give Noel a quick course in using thin, fragile pages of gold leaf to letter on glass. 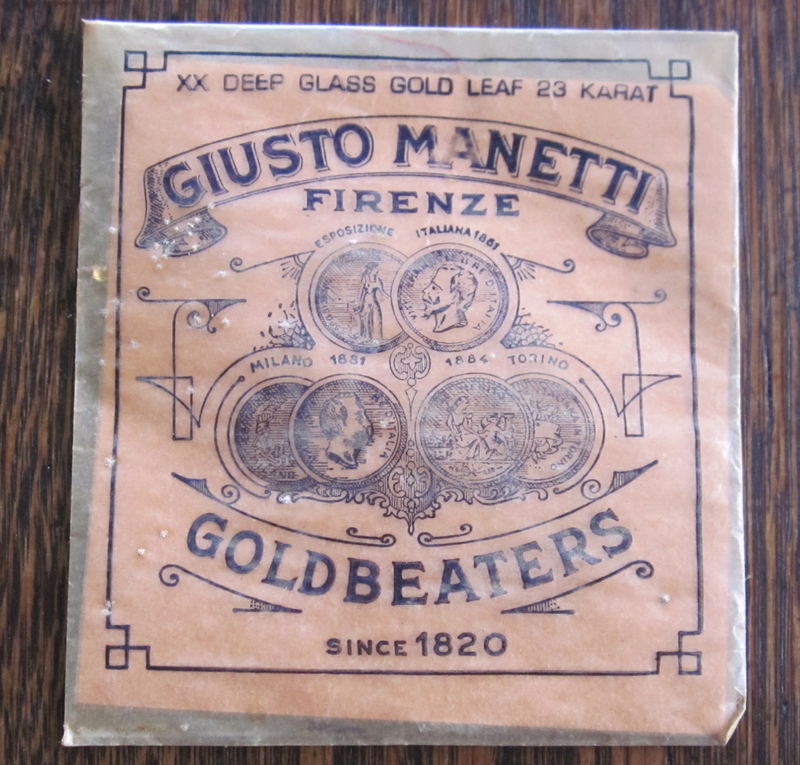 This process of glass gilding involved buying empty gelatin capsules at the drug store (that took some explaining), which were then dissolved in water and applied to the glass as a sticky surface to letter on. She gave him a copy of her favorite book on the subject—Gold Leaf Technique, by Raymond J. LeBlanc—along with some specialized brushes and a tiny envelope of gold leaf—more than enough to finish a number of mini projects—to get him started. As Noel had learned hand lettering in advertising art classes at Los Angeles Art Center (in the Stone Age when young art directors specked type and hand-lettered their ads) he had the tools necessary to take on the challenge. Along with help from the people we met along the way, I am reminded of a girl, around age 17, who wrote us a thoughtful and articulate letter, asking if she could come apprentice with us after high school, living with us and learning our techniques. She liked what we did, and aspired to become a dollhouse maker in her own right. We thought a long while, wondering how we’d respond if Noel’s teenage daughter proposed something similar. Plus, we knew we couldn’t work with anyone else—our schedule was too erratic, our methods and life-style too off-the-cuff, and our house and studio too tiny to accommodate anyone else. And we talked about the varied paths that got us where we were. Noel’s art and advertising background, my growing up in a 200 yr. old house, and majoring in theater and running the scene shop in college played heavily in what we made in miniature. Plus, we’d learned a work ethic from years of working for other people. Our Dear Joan letter back to the girl explained all this and suggested she go to college, learn about everything she could, get a job, and figure out what she liked to do. Then, if she still wanted to make dollhouses, she’d have all the background necessary. Yes, killjoys, but maybe she’s out there doing something she loves. Given how motivated she was then, I have my hopes. This entry was posted in Bio, Houses, Miniatures, People and tagged architecture, arts, dollhouses, gold leaf, lifestyle, miniature floor tiles, Victorian architecture, work style. Bookmark the permalink. I would love to subscribe but can’t find where to do that….I don’t see it at the top of the post. I am that 17 year old girl now…at 47. I’m sorry to have found you and Noel after you retired! Thanks for the legacy and blazing a path for all of the grown ups who want to ‘play’ with small things! How great to hear from you after all this time. Keep on playing!